Kids just love the concept of aliens flying around in flying saucers and visiting from outer space. You can tie this craft in with a story about space and what type of creatures might live there. It can be a literacy lesson, practicing speaking and listening skills, as well as the craft itself being great for fine motor skills. This is a fun craft for young and older children to make. 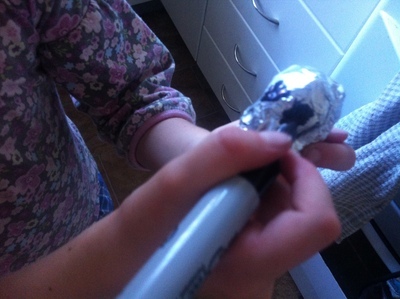 Under 5s will have a wonderful sensory experience crinkling the paper and foil up and once created, they can play with it for added fun. 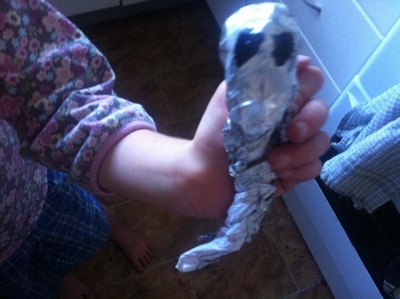 Time: 10 minutes to make the alien, opportunity for story telling and extended play. First take your piece of paper and scrunch it up into a nice alien shape. Ours was bulbous at one end and tapered off at the other. 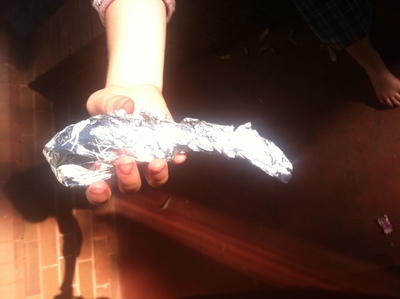 Next, wrap the paper in foil, twisting towards the bottom of the foil, being careful to retain the shape. Finally, draw eyes on the alien and you're done! Here is the finished product. You can make a few of these to play games with.